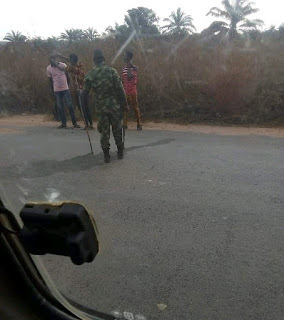 I'm traveling back from the village and these soldiers stopped our bus. First, this one questioned our driver for playing music that reminds him of his days in the 'depot.' Then he asked these three guys to come down for carrying full hair. Now they are making them barb each other with the blunt razor they forced our driver to provide. I don't know when carrying full hair or playing music in the bus became illegal that these soldiers had to detain us for over 30 minutes. 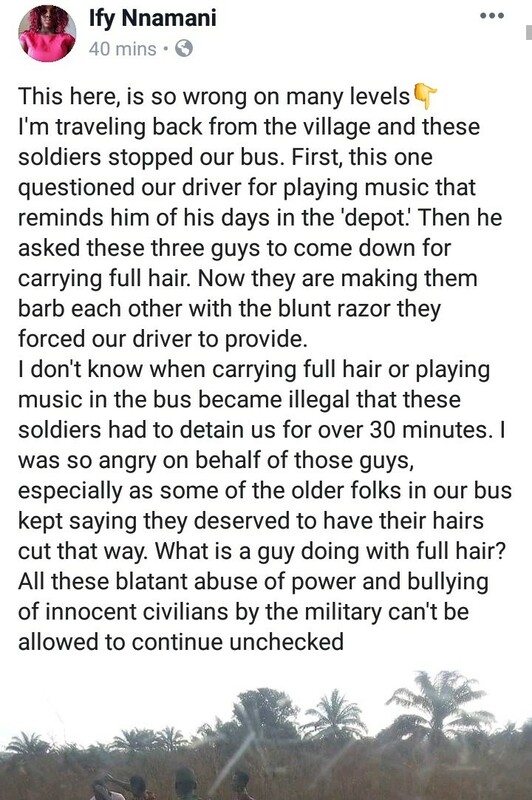 I was so angry on behalf of those guys, especially as some of the older folks in our bus kept saying they deserved to have their hairs cut that way. What is a guy doing with full hair? All these blatant abuse of power and bullying of innocent civilians by the military can't be allowed to continue unchecked.